Beta-testing the Black Horizon App. Photo courtesy of USAF Maj. Christina Light. 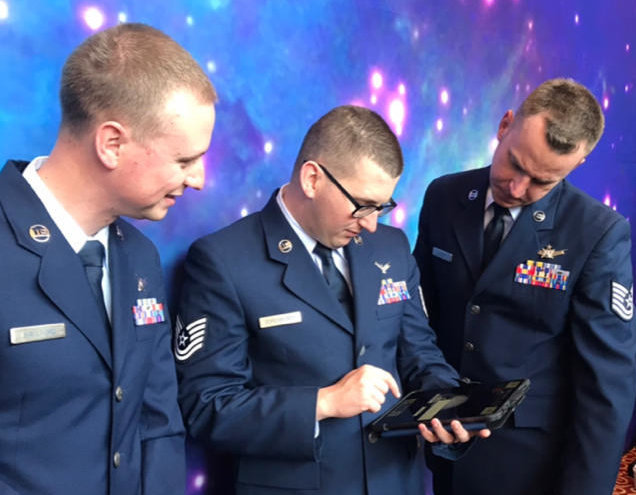 The Blue Horizons Program at Air University has rolled out Black Horizon, a mobile application that delivers lessons in spacelift, orbital mechanics, and satellite constellation design for the U.S. Air Force. The student-adaptive educational app, covers the full range of space education requirements which will augment and accelerate the traditional space professionalization education program. Black Horizon was first announced in December 2018 as part of the the Spacecraft Engagement Simulation Experiment Challenge with Blue Horizons technology partner MGMWERX. Sonalysts, Inc., based in Waterford, Conn., was the winning vendor of the challenge. The company partnered with Blue Horizons and MGMWERX to complete the design, engineering, and build sprints. Beta testing was conducted at the 2019 Space Symposium in Colorado. MGMWERX Director Steve Werner added that Black Horizon is on track to save the Air Force more than $500,000 and five months in development. The post Black Horizon USAF Space Education App Makes its Debut appeared first on Via Satellite.